Here is my first addition to your museum. The Commodore 4032 contains 32kb of memory, 12" green screen, full sized keyboard and number pad. It has an optional plug-in tape recorder which the earlier 2001's had built in. I also have a Commodore 4040 disk drive system but I have no DOS to run on it. 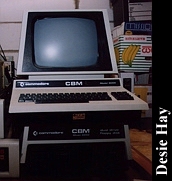 This machine was released around 1980 and was aimed at the business market (CBM stands for Commodore Business Machine). They also made 4016's and 4064's which are the same machine but different memory configurations! Click here to view all comments for the Commodore CBM 4032 and to leave your own.